Trying to find nearby concerts, date night ideas, or simply an excuse to get out more? Google wants to help. The search giant's latest addition to, well, its search engine will help you find interesting goings-on in your neighborhood. 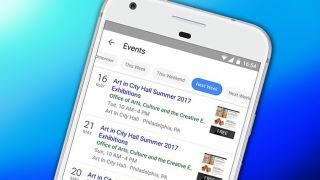 With new search options rolling out to Google's mobile site and dedicated Google app for Android and iOS, users in the US can pinpoint upcoming local events. From there, users will see a selection of matches, complete with basic information like the event's date, time, and venue. The update also adds filters to quickly change what time frame you're searching for, should you want to compare what's going on tomorrow, this weekend, or even next week. According to Google, event websites like Eventbrite, Meetup and more can also optimize the experience, allowing users to buy tickets or learn more with an extra tap on the screen. A Google representative tells us that folks can expect the feature to roll out within the next day or so, and that the company has no further plans for bringing the feature outside the US at this time. For those traveling abroad, Google's dedicated Trips app does point out places of interest even when offline, though admittedly it's not the same as up-to-date event listings.